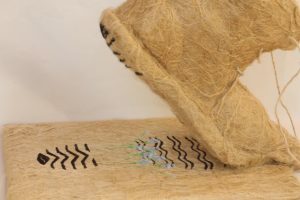 The use of rushes, flax and other natural or recycled materials in my work, draws heavily on our heritage and makes ‘Mi Camino’ a very fitting installation during the Brigid of Faughart Festival. Like Brigid, I set out on a journey, guided only by curiosity and intuition, I walked on in blind faith and trusted. The theme of this years festival is ‘Brigid – muse to the cultural creative’, and I am an artist who’s creativity is fed by my Irish culture. Of course, St. Brigid is synonymous with rushes and like her I use them to give visual expression to concepts, labels and emotions that cannot easily be explained. Through my research into flax I discovered how important the rushes were for tying up the bundles of flax. The rushes were joined together using a rush knot (like a reef knot) to form a rush band. Hence, the Rush Knot is my logo and Rush – Not is my moto! Although some of my work is labour intensive and repetitive, for me it is always meditative. It is the process and not the end that is important. My message is simple ‘slow down’. Stay curious, buy only what you absolutely need and find joy in the handmade. 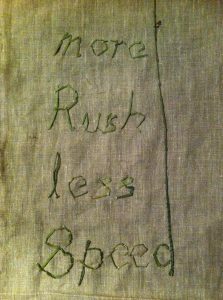 ‘Rush not through life – so easy to dismiss what has gone, so eager to reach a destination that might not exist but rest awhile to enjoy what is being presented to you, for you to experience in your own unique and special way’. I enjoyed so much your art at the Brigid Festival, your approach to the whole thing and having had the plssibility to meet you. Thank you so much Barbara for those kind words it was a pleasure to meet and share at the Gaol. your work and the spirit within is so near to me. I will visit you for sure – together with my Beguin Sister Claudia this summer.